Problem 1: Canada struggles to understand how it can fit the ‘idea economy’ into the broader economic context (i.e. other sectors). Thus, Canada should take steps to foster the idea economy. The world is changing, and Canada needs to understand how the tenets of the idea and knowledge economy will best flourish across the primary sectors that drive the broader Canadian economy. Building regional collectives (like the Waterloo-Kitchener corridor) to advance innovation is only one step, whereas our findings suggest the need to take a collective leap and author a White Paper that will activate a national approach on the new, ideas-based economy. In doing so, the Government of Canada will engage a collective of stakeholders, thought leaders and businesses both large and small to lead a national dialogue on how innovation ought to play out across Canada’s diverse communities, companies and campuses. Problem 2: Canadians do not recognize the unique strengths of the economy as it is, and neglect recognition of the innovations already taking place. Canada should change the narrative. Innovation is happening, but it is taking place in sectors and industries different than the ones we tend to pay attention to. Increasing awareness about the need for, and impact of, innovation within advanced manufacturing, natural resources and agriculture will help cross pollinate the economy with more robust, productive approaches and solutions. This will also help to shift the culture of entrepreneurship by empowering a generation of Canadians to create sustainable value and ensure they and their communities prosper. Problem 3: Canada currently allocates a disproportionate amount of resources (talent and capital) to "tech solutionism", at the cost of others. This work was completed by a team of Master of Design students in OCAD U's Strategic Foresight & Innovation program. Canada should redirect the pipeline. The ultimate step is to increase the carrying capacity of the system to generate value for entrepreneurs from outside the technology sector. Drawing sectors and industries together with the innovation ecosystem will build deeper and more diverse connections. Diverting the flow of resources – talent and capital – and binding it with existing infrastructure and institutional support will build a depth that will support a more robust Canadian economy. Furthermore, investing in improving the structures that nurture prosperity – incubators, accelerators, entrepreneurship, and innovation programs – and bringing them together with campuses and companies already making an impact, will propel Canada forward. A robust innovation ecosystem has the ability to improve productivity, economic growth, and job creation metrics in countries adequately supporting this process. In these countries, there also tend to be more resources available to support spending in education, health, and infrastructure, to name a few (“Innovation details and analysis”, 2013). Accordingly, the importance of a healthy innovation system is tied closely to that of a healthy national economy, along with its people, communities and institutions. In Canada, however, economic discourse around innovation and entrepreneurship has recently pointed towards a decline in productive returns from startup investment. Although an improvement from previous years, in 2015 Canada was ranked 9th out of 16 peer countries in innovation by the Conference Board of Canada, receiving a letter grade of “C” on its Innovation Report Card (“Innovation details and analysis”, 2013). This ranking points to a persistent weakness in the Canadian innovation system, commonly referred to as the “innovation gap”. This phenomenon is being reported by some of the country’s top journalists, startup CEOs, established investors, think-tanks, and members of various levels of government across the country. While these reports highlight culture, politics, economics, and education as the cause of this gap, and underlining the need for reform, policy changes, and new programs, few of these calls to action are gaining traction. There is no easy answer to this wicked problem. With the above in mind, we initially sought to answer the question “Why are investments in innovation resulting in diminishing returns in productivity?” through our research, but we quickly realized that in order to address this issue, we would first need develop a thorough understanding of the innovation ecosystem in Canada and thus we broadened our research questions to “How might we understand the Canadian innovation system?” all the while still focusing on this oft reported, elusive innovation gap. 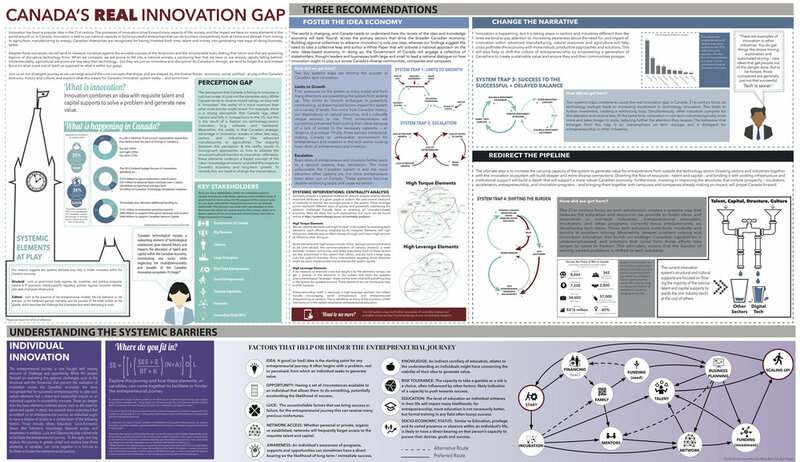 This synthesis map summarizes our research on Canada's systemic innovation challenges this past term. We used centrality analysis to examine our map of the system for potential leverage points. The elements that surface from this analysis offer opportunities (or, in some cases, roadblocks) for policy and program interventions. Interested in the full breakdown? Find the final paper here.